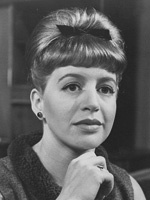 Ms Bruder played Ellen Lowell Stewart on As the World Turns from 1960-1995. 07/04/1975 0303 The Slave When two friends agree to be the other's slave for a year in the event that they lose the bet they made, to what length's will they go in order to win? 10/15/1975 0362 The Kiss of Death In spite of the warnings of his advisers, an ambitious young doctor pursues the daughter of the town's local crack-pot after falling madly in love with her. 12/12/1975 0395 Marry for Murder Despite having different agendas, a pair of sisters engage the services of the same private detective to look into the affairs of the same man. 04/12/1976 0467 The Safe Judge When the son of the city's most fearsome gangsters pulls strings to get his son of drug possession charges, an upstanding judge finds his reputation on the line and he himself becomes a victim of blackmail. 10/29/1979 1025 The Alien Guest A greedy aristocrat is plagued by the spirit of the deceased cousin whom he murdered in order to take hold of his life and seize his wealth.